Have you ever actually been happy to see a group meeting coming up on your calendar? How many times have you said “I wish I didn’t have to go to this meeting so that I could get some real work done”? Worse, how many times have you walked out of a conference room muttering “well, that meeting was pointless”? There are thousands of environmental non-profit organizations operating throughout the United States. Many are found in cities. Most are focused on advocating for cleaner air, water, and soils, pushing for new legislation, regulations, and municipal services aimed at improving the local environment. Some environmental groups go beyond advocacy and organizing. They roll up their sleeves and play an active, day-to-day roll in stewarding the local environment. They start community gardens, care for newly planted street trees, or serve as auxiliary horticulture staff at public parks. These mostly volunteer-led initiatives end up becoming part of the local environmental governance scene, collaborating with municipal agencies and other big-name groups to make a demonstrable impact on the health and function of urban environmental resources. I recently co-authored a research article on the steps that some of these hands-on stewardship groups have taken to measure and monitor the impacts of their work, looking mostly at cases from NYC. It turns out that most small groups struggle to bring environmental science into their regular stewardship practices, but they all dream of being able to see, in real time, whether or not their efforts are actually working. The article, published online in the peer-reviewed journal Local Environment, explores the different ways in which groups are participating in the science of outcomes monitoring whenever they actually can find a way to make it work. Most groups are creating their own D.I.Y. methods and metrics for measuring the outcomes of their work. Though they may be simple in scope, these homegrown efforts are an important first step toward collecting and analyzing data about the efficacy of small-scale stewardship programs in cities throughout the world. Though all of the groups I interviewed struggled, to some extent, to measure their impacts, they all wished they could do more to self-assess their efforts. Future research may show ways to make outcomes monitoring more accessible to small stewardship groups. A lot has happened around this topic since I collected field data for this project during the summer of 2012. During the summer of 2013, the Design Trust for Public Space launched the Five Borough Farm initiative to begin helping community gardeners and urban farmers in NYC measure all the good things happening at their various sites. If I were to do another round of field research for a follow-up article, I would need to take into account the dozens of gardens and farms now collecting outcomes data through Five Borough Farm. As more projects like Five Borough Farm come online, we may see more and more opportunities for stewardship groups to easily and confidently measure the outcomes and impacts of their work. If you belong to an environmental stewardship initiative in your city, I would love to learn about the ways you and your neighbors are collecting data about your work. Drop a line and let me know what you’re up to! Note: The research article referenced above is behind a paywall but is freely accessible to most library patrons through online journal databases—particularly those at colleges and universities. If you are having trouble accessing the article, please contact me directly. So begins the Guide to Green Infrastructure: 5 Projects Any Community Can Do—a handy little how-to for gregarious greenies in neighborhoods across the United States. 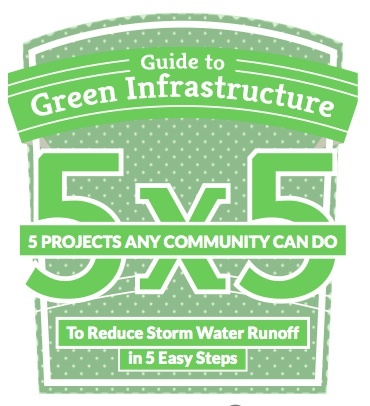 The guide is short and sweet and full of useful tips for transforming any urban community into a sponge for stormwater. It includes instructions for building bioswales, rain gardens, and simple rain catchment systems. It also offers advice on tearing up sidewalks asphalt to create more permeable soil surfaces for soaking up the stuff that falls from the sky. I contributed a one-pager on street tree stewardship for stormwater management. My first tip? Phone a friend and have some fun. The best street tree stewardship events are those that could easily be mistaken for 4th of July block parties. Download the Guide to find out more! And if you live in New York City, you can up the ante with your street tree skills by enrolling in a “Citizen Pruner” course with Trees New York. The Guide to Green Infrastructure is published by IOBY, a fantastic group that helps D.I.Y. do-gooders find the funds to launch exciting new projects in their own backyards. Check them out and consider giving some cashola to an initiative in your area today. The recently overhauled Google Maps seems to draw on a deeper and broader inventory of geographic data. This is good news for anyone who wants to find the name of a tiny creek or an abandoned rail line without having to sift through inaccessible physical archives at a local library or planning commission. Mapheads rejoice! 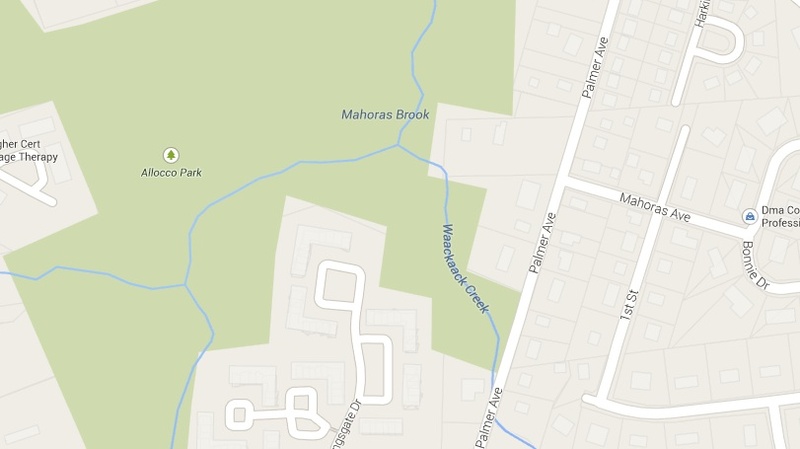 I’ve often toggled around in both Google Maps and Google Earth to trace the lines of a small creek I enjoyed exploring as a 14-year-old in suburban Monmouth County, New Jersey. Up until recently, these blue squiggles remained nameless on the map, too small to justify a cartographic tag. Last night, while taking a break from studying, I was pleased and surprised to find that the liquid landscape from my teenage memories suddenly had a name in the new Google Maps. Mahoras Brook flowing into Waackaack Creek near Allocco Park at the northern edge of Holmdel Township along the Bayshore in Monmouth County. There it is. Nothing special, really. Yet I’m overwhelmed with excitement over the possibility of learning more about this little watershed, forgotten on most maps (up to now) and beleaguered by nearly thirty years of suburban sprawl. How did native Lenapi interact with this brook? Was it of any use to Dutch and English colonists, or just another minor drainage ditch in this coastal county? Maybe there’s nothing much to learn about Mahoras or Waackaack, other than the vagaries of how they came to get these names. That’s fine, though. Every little bit of extra information helps tie me back to that unnamed creek where I spent hours building bridges out of fallen logs and bushwhacking through meadows of phragmites. I’m a sucker for the history of New York Harbor. 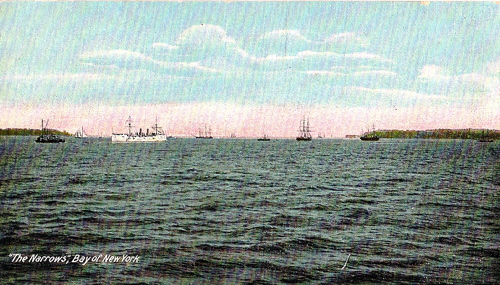 I horde old maps and postcards like this one of the Verrazano Narrows long before there came to be a Verazzano Bridge. Every year, I re-read Joseph Mitchell’s stories about old sailors and fishermen and oyster farmers and saloon keepers centered around Fulton Fish Market. I slowly make my way through his tales about Old Mr. Flood, a bona-fide curmudgeon hell-bent on living forever that puts his faith in the restorative powers of oysters and cigars and pretty girls. I follow Mitchell down beneath the shallow waters of the harbor in the first half of the 20th Century and discover shipwrecks, sea-worms, and an undulating current of sewer-borne slime that continues to pollute the harbor to this day. I was born and raised in New Jersey, along a crescent of land just beyond the periphery of the area charted in Mitchell’s stories. We lived in Newark until I was two or three years old, whereupon we moved to the suburbs near the southern reaches of the harbor. Every weekend, we re-traced our steps and wandered back to the familiarity of our old neighborhood in Newark, an enclave of Portuguese immigrants living as if some chunk of Lisbon had simply been copied and pasted into a corner of northern Jersey. That weekly journey back and forth, driving through the wetlands of Cheesequake Park, over the Raritan River on the Driscoll Bridge, along the industrial oil-swamps of the Arthur Kill, past the patchy remnants of the Newark meadows, and into the arms of the Passaic River, etched the geography of the harbor deep in my mind and my heart. My personal history—and a good chunk of my family’s history in its exile from Portugal—is dissolved in the streams and rivers and wetlands that make up the harbor and its estuaries. Tonight I find myself thinking about my grandfather and his relationship to the harbor. After retiring from more than forty years of hard labor in an iron foundry, grandpa found that he liked to pass his time hanging out in a fish market on Ferry Street in Newark. Up at dawn, he would tag along with the proprietor to make the daily wholesale fish purchase at Fulton Market in Manhattan. Like Mitchell’s Mr. Flood, he found solace in the rows and rows of bass, flounder, skate, squid, octopus, sardines, and everything else trawled up from the sea. Dinner, more often than not, had fins. Sadly, grandpa didn’t live as long as his fictional counterpart. A lifetime of sooty foundry work gave him lung disease and a weak heart, with no hope of finding a few extra years at the bottom of a bag of briny clams. Fulton Fish Market would eventually pull up stakes and relocate to Hunts Point in the South Bronx, leaving behind a defunct mall and promenade of boarded up buildings where Mitchell’s characters once roamed. 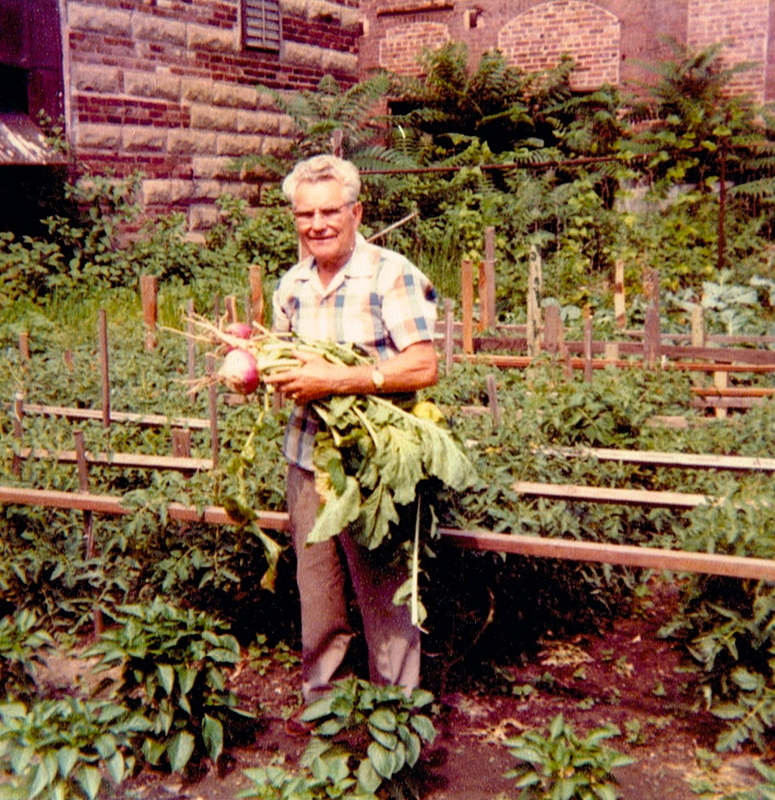 Grandpa in his garden behind the fish market.